CHIMPS IN CHICAGO: Kelly Adams, Diane Durand, Matt Sullivan, Jim Nuttle and Nate DaleyThis week has been a walk down memory lane. Or the Magnificent Mile, as it were. 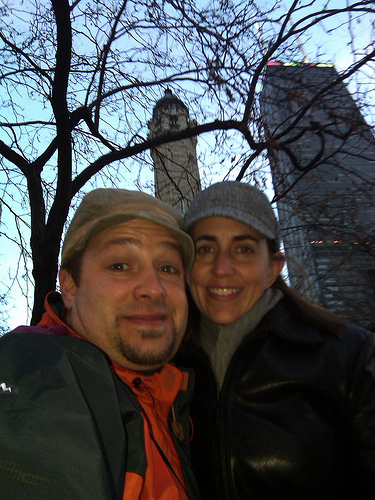 Ten years ago, just before Thanksgiving, an extremely nervous Peter Durand proposed to Diane Cross at the top of the Hancock Building in downtown Chicago. It was work getting that woman up in that building! After cajun food at Seven on Heaven, she wanted to try on pants at Eddie Bauer, check out some stores, do some window shopping. Meanwhile, I was trying to get her up the express elevator to the observation deck before the winter sun set! After 6 years of dividing duties between homelife with kids and roadlife with work, both Diane and I are supporting an event (sans children) in the city where we met and married. To add to the fun, we are working with several of our friends from our wild and wooly days as young twenty-somethings causing trouble in this grand city. With six superscribes, we are having a blast watching each other capture client ideas and create crafty cartoons. So thankful that we started this fun adventure know as Alphachimp Studio over a decade ago, and, thanks to the fun and talented friends involved, we are starting the next decade of making stuff and making stuff happen!